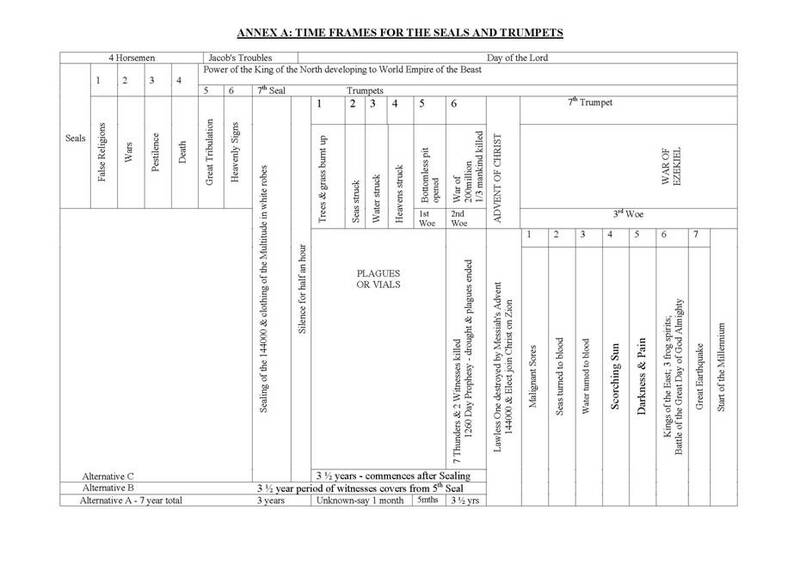 The seven trumpets of Revelation lead up to Messiah. The wars of the end are part of this sequence. The actual sequence is detailed with a flow chart of the seals and trumpets. Previously we went through the concepts of the Great Tribulation and the heavenly signs and the sealing of the 144,000. We then went to the concept of silence in Heaven for half an hour. This silence is a watershed. We are sealed. It introduces the activities or processes leading up to the coming of the Messiah. Through the heavenly signs, everyone on the earth knows that the Messiah is coming. Once the heavenly signs occur people are made aware of the heavenly activity. These kings and generals are then all saying: “hide us from the wrath of the one who is to come”. Messiah is to come, but he is not there yet. It is obvious from the heavenly signs that most people, including the leaders of the planet, know that Messiah is coming. They all know something is going to happen. We will go through Matthew 10 and deal with what Christ said. We are all there as sheep in the midst of wolves. We are not there with power. Normally, when a sheep is sent into a wolf pack it becomes lunch. So we don’t go there with our own power to deal with these people; we go with the power of the Holy Spirit. This means that we have to use these concepts and the power of the Holy Spirit so that we cause no offence. However, we stand for the Lord and we nevertheless become a witness even though we haven’t got physical strength in the same way they have. The power of the Holy Spirit can bring down strongholds. It is not weakness in terms of the Holy Spirit that we go out amongst them. It is not by might or power but by My Spirit says the Lord of Hosts (Zech. 4:6). Frequently we must pray for the inspiration that the Lord and the Holy Spirit will give us the things to say. The Lord gives us what we need. Normally, preparation is essential to any good work. The Lord, however, gives us the words to say under duress and trial. He provides what we need and He does things to teach us lessons as well. It becomes evident that there is a lesson in the way with which we are dealt. There are very few accidents in our lives. We know that the Lord is dealing with us because we get too many coincidences. Things just fall into place and we know that’s what is happening. This whole concept of the Spirit speaking through us occurs throughout this tribulation right to the end. The Spirit convicts us of what we are to say and do in given situations. This has been happening to the elect on this planet over this century, and it certainly happened under the communist system, and it will continue worldwide under the Beast power – which is an extension of the state system. 22and you will be hated by all for my name's sake. But he who endures to the end will be saved. 23When they persecute you in one town, flee to the next; for truly, I say to you, you will not have gone through all the towns of Israel, before the Son of man comes. Now that is a key Scripture. We will be on the move. Israel will be under attack and will be invaded. All Israel will be extant, and we are not talking about the Israelis in Jerusalem and the State of Israel. We are talking about the nations of Israel. They will be invaded and we will be going from city to city. That is not very far off. This whole process of war is an unfashionable one. A lot of people glamorise it, especially Hollywood, but be assured that it is not a pleasant exercise, and keeping people alive is the biggest problem we face. After this silence we are given the seventh trumpet. Revelation 10:1-7 Then I saw another mighty angel coming down from heaven, wrapped in a cloud, with a rainbow over his head, and his face was like the sun, and his legs like pillars of fire. 2He had a little scroll open in his hand. And he set his right foot on the sea, and his left foot on the land, 3and called out with a loud voice, like a lion roaring; when he called out, the seven thunders sounded. 4And when the seven thunders had sounded, I was about to write, but I heard a voice from heaven saying, "Seal up what the seven thunders have said, and do not write it down." 5And the angel whom I saw standing on sea and land lifted up his right hand to heaven 6and swore by him who lives for ever and ever, who created heaven and what is in it, the earth and what is in it, and the sea and what is in it, that there should be no more delay, 7but that in the days of the trumpet call to be sounded by the seventh angel, the mystery of God, as he announced to his servants the prophets, should be fulfilled. The seven thunders have a portion of a message, which will occur in the days of the Witnesses, i.e. in the Last Days. At the end of this time the final Mystery of God will be revealed. The 1,260 days finish, and the droughts and plagues are temporarily at an end. The Mystery of God is only fulfilled, completed and understood in the seventh trumpet. When the sealing of the 144,000 is completed this mystery is revealed. When that takes place and God pours out His Holy Spirit on the elect, we reveal the Mysteries of God, and then they will be fulfilled. That is what is happening at the moment. The structure has to be removed and dealt with because the Trinitarian and modern paradigms are wrong. The traditional ministry don’t understand the Mysteries because they are all blind guides. In order to get the Mysteries of God out to all people we have to bypass or remove the blind guides. We are seeing this happen now (see the paper Measuring the Temple (No. 137)). We have to look at the whole process of each of the trumpets. We go through a sequence of actions that cripple part of the earth. When we look at the trumpets they deal generally with thirds. There is a third sequence taken because the rebellion involved a third of the Host. Everything is done for a reason and everything is done in spiritual symbolism. Revelation 8:7-13 The first angel blew his trumpet, and there followed hail and fire, mixed with blood, which fell on the earth; and a third of the earth was burnt up, and a third of the trees were burnt up, and all green grass was burnt up. Note the sequence of the damage to the earth in fire and hail and the contamination we see as blood. This is happening now also in the droughts and the fires and the algal blooms and the contamination of drinking water. This contamination is then followed by the contamination of the seas to a third of their extent. We are looking at the destruction by heavenly means; this could be meteors etc., and all sorts of other things such as physical catastrophes that burn up a third of the planet, trees and all the grass. We are looking, then, at general famine arising from drought. This sequence then goes on. The mountain falling into the sea presents a number of options in terms of this second trumpet. We are probably dealing with each of these things by doing the same thing that Moses did in Egypt. Moses rammed the gods of Egypt back down the throats of the Egyptians. In the same way, all of these things ram the gods of this planet back down the necks of the people we are dealing with, as well as the religious structure and concepts and values of this planet. This whole structure of the trees, grass and the first trumpet will deal in part with the New Age movement and the preoccupation with animism – the concepts of worshipping trees and spirits. The religion of the New Age is becoming a monist structure, which is essentially animist. They believe there are spirits in everything. It is an obscenity to say God is in everything. God is not a monist structure. God is not immanent – He is transcendent, but with the capacity to enter anything. God created everything but He is not in everything, in terms of animism. That process develops. We will see a New Age movement take over with a concept called process theology. This is where they attempt to make God immanent. That is the Babylonian system. It will take over again with more force akin to Buddhism. It is aligned with Buddhism and the Eastern liberation theologies. The concept of the seas struck then follows the mountain being thrown into the sea. Animism extends into Shintoism, which is from Japan. Their most sacred mountain is Fujiama, a volcano. The earthquake activity that throws a mountain – for example, Fujiama – into the sea appears to be God dealing with the concept of Shintoism and other Eastern religions. By literally picking up volcanos and throwing them into the sea, and destroying islands, we have massive movements of the earth’s crust. Part of these massive movements was engendered by Russians, Chinese and Americans conducting underground nuclear explosions on a systematic basis and destabilising the earth’s crust. Subsequent earthquakes were part of deliberate trigger mechanisms fired underground. The Chinese set the last lot in motion because their bid for the 2000 Olympic Games wasn’t successful. The nuclear explosions in 1995 caused a furore over France, but China is hardly mentioned. Why? Because nobody can influence China. China is more dangerous than France. However, both will participate in the violence of the wars of the end. The people are perverted with mindsets that are open to Satan. All we can do is be aware of what is happening. These people are being used to destroy this planet. The trigger mechanisms being deployed are destabilising the crust and there will be a series of earthquakes that will be of great significance. The great earthquake that occurs in the heavenly signs will be the greatest earthquake the world has ever seen. This triggers the following sequences within the prophecy. That will have something to do with the movement and destabilising of the mountains; but also the tectonic plates on the planet cannot stand that sort of destabilisation, and the San Andreas Fault is ready to go. There are earthquakes all over the planet, but the biggest one we have ever seen will occur in this heavenly sign and will destroy vast numbers of living organisms, people and animals and destabilise the seas. The last earthquake will be even greater. That earthquake activity will also release heavy metals into the seas from the mantle. Those heavy metals will be taken up into the food chain, into the dino flagellates, and there will be great red tides. The great red tide problem will be exacerbated also by the fact that massive quantities of nuclear waste are being dumped into the Artic and Japanese seas and in the north-eastern seas by the Russians en masse. The nuclear waste put out there is frightening. Much of the northern hemisphere will die. We can say: “Are these people mad; can they not see what they are doing?” Yes, they can see what they are doing. However, they are locked into paradigms and thought processes, and they will not alter their way of life. America (and the West generally) consumes enormous quantities of the world’s energy. In order to lift India up to the standard of living of America, it would need to consume 110% of the total world energy production. So, clearly, the American way of life is unsustainable. They have to modify their behaviour, but they will not repent and they will not modify their behaviour; and their religious leaders in fact encourage them in this form of living. Before the Feast of Tabernacles in 1994, the Sydney Morning Herald said that the Russians cased a sunken Russian submarine in super glue, which was going to last 500 years. They can push it off for 500 years; however, the radioactive half-life of the plutonium is 25,000 years. This plutonium was due to leak in to the northern oceans in 1995, or at the very latest the year after. Plutonium waste from a sunken submarine going into the sea will trigger off vast destruction in the oceans. The stages are set. Nobody put a nuclear submarine together and stuck it in the bottom of the sea other than through the greed, avarice and viciousness of the people who built the thing. They are destroying their own environment. The name wormwood in Russian is Chernobyl. They built nuclear reactors out of substandard materials and they didn’t police them because there were no controls and no people to tell them what to do because they were dictators. They have their own wormwood. The star does not need to fall for them; it is already there. That has been encased in concrete and the concrete is breaking down. So they don’t know what to do. The concrete is now radioactive so they are going to get a bigger concrete block to encase it. The activities of stars are in nuclear activities, and the nuclear facilities around the world will continue now to deteriorate and be misused and progressively destroy the drinking water of the world. It will be by stages into a third as we see here; and then totally under the vials of the wrath of God. Whether it is an actual star that pollutes the planet or just nuclear fallout is difficult to know. It says a star, so we will take it as meaning this. Certainly it pollutes a third of the waters. The structure of the planet is then diminished and made uninhabitable. Where do we stop? The system is unsustainable. The sites are unsustainable; but they have to be changed. A third of these seas are going to die. It is not just a slow death. A third of the ships are destroyed because of something else that happens. There are tsunamis associated with this death, and this mountain that is thrown into the sea. Krakatoa is an island in Indonesia. On the island was a volcano that blew up last century with the strength of a number of nuclear weapons. The whole sun and moon darkened. The fallout (dust etc.) covered the earth for months. It went right around the earth. The explosions were heard as far away as the capital cities of Australia. It is a long way from Indonesia to Australia to hear an explosion. This will be a similar thing. The Olivet prophesies talk about the roaring seas terrifying people. Tsunamis travel at nearly the speed of sound: about 700 mph. The waves reach hundreds of feet in height. With the massive earthquake activity they are going to be up to 1,000 feet high. So, we can expect to get waves 1,000 feet high travelling at 700 mph. Imagine the sheer volume and force that will deal with these nations. This is how a third of the ships are going to be destroyed. The people will be absolutely terrified. Unless we know it’s going to happen and what is behind it all, we would be terrified too. Our problem is not being afraid. Fear is not our problem because we know what is going to happen. These processes occur because people are destroying the planet on a systematic basis. This will be accelerated in order to deal with them. 1. the earth mantle problem. 2. the earth warming process. Let us look at the levels involved with the seas. The West Antarctic basin has water as ice below sea level. According to the scientists, there is enough to raise sea levels about 15 feet if that ice melts. This will accelerate the process. Once the Antarctic and the Greenland ice caps go and the oceans increase in temperature, the potential lift is 200 feet – with a possible further 100 feet. People below this height have a very good chance of being under water. The final heavenly signs under the fourth trumpet will see the earth warned as we then progress to the war of the fifth trumpet. The conditions for the war of the fifth trumpet were laid in place when the chemical and biological weapons of the Cold War were developed from WWII and distributed to the various countries depending on their allegiances. This develops into the great and terrible wars which are the woes of the earth. What happens then is that a third of the rivers are destroyed as the rivers are inundated. The Mississippi basin, North-west Europe, Thailand, all lowland China, all the Chinese food bowls will be gone. We then put complete pressure on the planet to sustain life. Then vast wars become necessary to relocate peoples in order to get to the remaining food bowls, because the major food bowls will be gone. We see then why we go into the next phase, which is Revelation 8:13. This is the start of the woes. There are three woes. We will go back for the next sequence. We have got the Time of Jacob’s Troubles, and Israel is being dealt with. We have had the great tribulation, and we’ve also got the Witnesses of the Last Days. At this point we turn to Revelation 11:1. Revelation 11:1-8 Then I was given a measuring rod like a staff, and I was told: "Rise and measure the temple of God and the altar and those who worship there, 2but do not measure the court outside the temple; leave that out, for it is given over to the nations, and they will trample over the holy city for forty-two months. 3And I will grant my two witnesses power to prophesy for one thousand two hundred and sixty days, clothed in sackcloth." The Temple is measured from the top (see the paper Measuring the Temple (No. 137)). This is happening and has happened. The ministries are measured. This also has happened. In the time of the 42 months, the elect as the nation are purified. We are now going through the process of the measuring of the elect. That process will take a while. The elect are given over to deal with each other and that is part of the way we are measured. After the commencement of that measurement, the Two Witnesses stand in Jerusalem clothed in sackcloth. These people will stand for three-and-one-half years (see also the paper The Witnesses (including the Two Witnesses) (No. 135)). 4These are the two olive trees and the two lampstands which stand before the Lord of the earth. 5And if any one would harm them, fire pours out from their mouth and consumes their foes; if any one would harm them, thus he is doomed to be killed. 6They have power to shut the sky, that no rain may fall during the days of their prophesying, and they have power over the waters to turn them into blood, and to smite the earth with every plague, as often as they desire. 7And when they have finished their testimony, the beast that ascends from the bottomless pit will make war upon them and conquer them and kill them, 8and their dead bodies will lie in the street of the great city which is allegorically called Sodom and Egypt, where their Lord was crucified. Christ was crucified on Golgotha outside of Jerusalem. The Witnesses are calling Jerusalem Sodom and Egypt due to the apostasy in it. The concept here is that they will stand to deal with the power of God. They will speak and people will try to kill them, but those people are dealt with in the same way they deal with the Witnesses. Anyone who tries to shoot them will be shot. The Witnesses are protected, and nobody can kill them for three-and-one-half years; they are indestructible. They can call down fire from Heaven and will do so. They will shut up the heavens and no rain will fall on this planet for three-and-one-half years, except as they dictate. They are at this point turning the seas to blood. These things are a direct result of these two officers of God thrusting down the throats of the people the entire idolatrous process of this planet. We have already been sealed at this point. We are coming out of the Great Tribulation. Our robes have been made white in the blood of the Lamb, and we will see this happen. During this three-and-one-half-year period we will watch these people and see these things being inflicted on this planet. There is only one thing given to us, and that is that our bread and water will be sure. That is the only thing of which we can be sure. God will feed us with manna. We can ask: “How will we get our bread?” When we fall short of bread, remember God’s promise. Our bread and water will be sure. We will be fed in the same way the Israelites were fed in the wilderness. It is a question of faith. We have to be so sure of what we are doing and what we are talking about because we have to get our people and ourselves through this problem. Following the Measuring of the Temple over the Trumpets we then increase to the Fifth Trumpet and then the Wars of the Sixth Trumpet and the Two Witnesses (No. 135). Revelation 9:1-21 And the fifth angel blew his trumpet, and I saw a star fallen from heaven to earth, and he was given the key of the shaft of the bottomless pit; 2he opened the shaft of the bottomless pit, and from the shaft rose smoke like the smoke of a great furnace, and the sun and the air were darkened with the smoke from the shaft. 3Then from the smoke came locusts on the earth, and they were given power like the power of scorpions of the earth; 4they were told not to harm the grass of the earth or any green growth or any tree, but only those of mankind who have not the seal of God upon their foreheads; 5they were allowed to torture them for five months, but not to kill them, and their torture was like the torture of a scorpion, when it stings a man. 6And in those days men will seek death and will not find it; they will long to die, and death will fly from them. A lot of people will want to die over this period but they won’t be able to die. The bottomless pit of locusts relates also to the four angels of the bottomless pit who are bound at the Euphrates. Those four angels were there to kill a third of mankind. Here we are dealing with war, aerial operations and chemical weapons. They are dealt with under direction from the demons. Note that the entire earth is not to be harmed yet but only those who do not have the seal of God on their foreheads. The armies that have these weapons use tanks and helicopter gunships and they use chemical weapons. The angel of the bottomless pit is in command of them and the area they operate from is the Middle East. It is for this reason that the world is concerned that Syria, being governed by the Allowite minority and in alliance with Russia, is quite capable of using these weapons against its own people. The Russian Foreign officials are in Egypt and the US president is making noises about the NATO forces and Turkey not tolerating the use of these bio-chemical weapons. Syria has Sarin and if they mix it they intend to use it. The Serbian officials went to Brussels in 2012 for a NATO conference and the Serbian ambassador to NATO met the Serbian Senior foreign officials at the airport and then simply walked to the parapet of the top level car park and threw himself off. He obviously could not tolerate what he knew to be developing. He was married with children. This bio-chemical war originating from the Middle East will commence the woes of the planet. This is the first Woe. The notation to the Annotated RSV says that the plague of demonic locusts – which combine the terrors of evil spirits and invading horsemen – are (they say) probably Parthians who come from Iran. There may be some, but overall this is a wrong assertion. The reference is also to a star falling from Heaven, one of the fallen angels, perhaps Satan himself, and then in reference to verse 3 they talk about locusts etc. These people see that there is a connection between the fallen Angel and the battle of Satan. The demonic Host is not just going to give up. This earth will be taken by force. When Christ comes here it’s going to be by force with armies of angels. They are not going to simply say: “Get out, it’s my turn”. We are then going to see Satan thrown down to the earth and confined in the bottomless pit. The story is reflected in the story “Star Wars”. The Return of the Jedi has Ewoks, and Darth Vader is being repelled and destroyed by Luke Skywalker et al. We are the Ewoks. The story deals with the process of stopping Jesus Christ. See the paper The Other Side of Starwars (No. 181). In the film they even have Darth Vader repenting in the end. His countenance is marred beyond resemblance. If we read Isaiah 53 we know who Darth Vader is. They have simply reversed the story plan. Jesus is now the bad guy working for the supreme baddy. All the rebel alliance is in fact the good guys. They are even named with names of demons, e.g. Obe-one-Kenobi. Obe is the Hebrew for familiar spirit. Obe-1 is the first familiar spirit. It comes from mumbling in a bottle. It’s used for a ventriloquist also. It was an Obe at the cave at Endor. Luke Skywalker is a shamanic name. He who walks in the sky is from a shamanistic system. All of these things are to implant a reversal of the truth in our children’s minds. This is how they condition the planet to march against Jesus Christ when he comes to Jerusalem, because they see all this and have been conditioned to see him as the enemy. It is a masterpiece of propaganda. Nothing but false messages and false prophecy has been issued and to this time we have exposed nothing. After this five-month period the first woe is over. There are two more to come. 12The first woe has passed; behold, two woes are still to come. 13Then the sixth angel blew his trumpet, and I heard a voice from the four horns of the golden altar before God, 14saying to the sixth angel who had the trumpet, "Release the four angels who are bound at the great river Euphra'tes." 15So the four angels were released, who had been held ready for the hour, the day, the month, and the year, to kill a third of mankind. 16The number of the troops of cavalry was twice ten thousand times ten thousand; I heard their number. 17And this was how I saw the horses in my vision: the riders wore breastplates the color of fire and of sapphire and of sulphur, and the heads of the horses were like lions' heads, and fire and smoke and sulphur issued from their mouths. 18By these three plagues a third of mankind was killed, by the fire and smoke and sulphur issuing from their mouths. 19For the power of the horses is in their mouths and in their tails; their tails are like serpents, with heads, and by means of them they wound. Tanks travel in trail with the guns behind. The barrel of the gun has a muzzle brake on it which looks like a snake with a head. Seeing this in vision in the first century, John is trying to describe helicopters and tanks. John had never seen a weapon of this sort. The biggest thing he would have seen was a ballista, which is a Roman catapult. To them these whole concepts were unbelievable or incredible. So we have the war of the sixth trumpet develop into a conflict of 200,000,000 soldiers. It will extend to kill a third of mankind. That is 2.3 billion people minimum. This conflict expands from the Middle East and goes North and East to the Yemen and then into Iran and Iraq and Kurdistan and then into Afghanistan and Kazakhstan and the other Soviet Republics to the Caucasus. NATO will go into these countries and they will be under command of the four great Morning Stars of the Fallen Host that were confined in the Bottomless Pit for this very time. We then see that the rest of mankind does not repent and is faced with the Advent of the Messiah and the vials of the wrath of God. This process is to bring them to repentance. That is what the Witnesses are saying: “Repent! If you do not we will destroy you”. They do not repent; so they were hit with one trumpet then the second etc. and finally the planet groans and they go to war. A third of the world is killed in this war because they do not repent. We have to make sure that people know they can repent. We have to tell them why they have to repent. There won’t be any negotiation with the Witnesses. This is not happening outside of the control of God; it is happening under direction from Jesus Christ through the Two Witnesses. We will be in control of this process, and we have nothing to fear. The planet groans under this process, and the war kills a third of mankind. We had the Great War for Civilisation in 1914-18 and it did not kill a third of mankind. That was supposedly the war to end all wars. Yet we were back into it again within 25 years. All this was nothing compared to these wars of the end. Following this the seven thunders sound which is a process of prophecy. This sequence deals with the The Warning of the Last Days (No. 44) that was foretold by the prophet Jeremiah (Jer. 4:15) and that prophet who comes out of Ephraim and Dan and warns the nation of the coming of the Messiah and what is to come to pass. The text then regresses again to the year 1987 when the Measuring of the Temple is begun in the last forty years of the Six Thousand years of the rule of Satan and the demons and the rebellious earth. Revelation 11:11-14 But after the three and a half days a breath of life from God entered them, and they stood up on their feet, and great fear fell on those who saw them. 12Then they heard a loud voice from heaven saying to them, "Come up hither!" And in the sight of their foes they went up to heaven in a cloud. 13And at that hour there was a great earthquake, and a tenth of the city fell; seven thousand people were killed in the earthquake, and the rest were terrified and gave glory to the God of heaven. 14The second woe has passed; behold, the third woe is soon to come. The Witnesses appear for 1260 days and then lie dead in the streets for 3.5 days and then they are resurrected by the Messiah and the First Resurrection commences. Thus the First and Second woes must occur prior to the Messiah and the First Resurrection. It is then that we see the seventh trumpet blown which is the Seven vials of the wrath of God which the Host pours out on mankind. See also the paper Wars of the Last Days and the Vials of the Wrath of God (No. 141B). At the ascent of the Witnesses we know it is the end of the second woe. The war of the sixth trumpet occurs and then is finished. The Two Witnesses finish off at the end of the war of the sixth trumpet and then are sent into Heaven. This is end of the sixth trumpet and the second woe. There is the clear dividing line. The will of God is done; the witness is done. Everybody hates them. We know this because they all give presents to one another when the Witnesses die. There is no repentance. They return to the lifestyles they practised before the Witnesses. Revelation chapters 12 and 13 deal with the Church. The elect are integral to this process and are dealt with in this section of the Bible. The whole process of dealing with the earth is conditional on the selection and handling of the elect. So the elect are dealt with first of all. They are sealed, and the Great Tribulation seals the Multitude and our fate is set. We are judged. Then the earth is dealt with, but does not repent. The sequence then goes on to Revelation 11:15, the Advent of the Messiah. We then look at Jesus returning to Zion. In Revelation 13 we look at the Beast dealing with men. Revelation 12 deals with Christ’s system. Revelation 13 deals with the Beast system. They are both contemporaneous. It does not happen after the second woe and between the time of the coming of the Messiah. These two systems operate contemporaneously prior to and during all the woes. Revelation 14:1-20 Then I looked, and lo, on Mount Zion stood the Lamb, and with him a hundred and forty-four thousand who had his name and his Father's name written on their foreheads. 2And I heard a voice from heaven like the sound of many waters and like the sound of loud thunder; the voice I heard was like the sound of harpers playing on their harps, 3and they sing a new song before the throne and before the four living creatures and before the elders. No one could learn that song except the hundred and forty-four thousand who had been redeemed from the earth. 4It is these who have not defiled themselves with women, for they are chaste; it is these who follow the Lamb wherever he goes; these have been redeemed from mankind as first fruits for God and the Lamb, 5and in their mouth no lie was found, for they are spotless. The concept of not being defiled with women means that they are spiritual virgins. The women are the concept of the churches of the earth. It is also a possibility that these people are the tribes. The 144,000 are taken out over a period of time. The selection of the 144,000 is by process of the churches over the two millennia (see also the papers The Harvests of God, the New Moon Sacrifices, and the 144,000 (No. 120); The New Moons (No. 125); and The New Moons of Israel (No. 132)). An argument might be advanced that we are dealing with two lots of 144,000. This matter will be addressed elsewhere. The sequence of the 144,000 is still attendant to or in conjunction with the Great Multitude. Our job is to help the whole nation and planet. We are not to worry whether we are in one group or another. To say who the nations are is being speculative. The identity of the nations needs to be developed more. However, everybody is going to be in Israel in the end. Everybody is going to be a spiritual Israelite over the Millennium, or they will be dead. At his coming Messiah slays the Lawless One, as we know from Thessalonians. The entire planet is placed under Messiah from this act, in sequence, commencing from the 144,000 through the Great Multitude and on into the Millennium. Until we know the song given to the 144,000 we don’t know if we are in the 144,000. No lie was found in their mouths. This is the key, for they are spotless. The concept is of adoration for God and His truth – and we are to be totally committed to the truth. Sometimes the truth is very unpalatable. We are committed to the truth and the truth sets us free. This is the real issue. We will be in the 144,000 if we are committed to and prepared to die for the truth. That is a lot of blood – a lot of dead people. 1,600 stadia is approximately 5 miles. We are dealing with Christ taking over the planet and we are dealing with him then forcing these people to repent. When Messiah returns to Zion we are with him (see the paper Trumpets (No. 136) for more information on the return of the Messiah). The Day of Atonement deals with the reconciliation of the planet – the bringing of the planet into repentance and setting it up for the Millennium. There is a whole sequence of time between the Advent of Christ and the start of the Millennium, and that comes out in the vials of the wrath of God. Revelation 16:1-21 Then I heard a loud voice from the temple telling the seven angels, "Go and pour out on the earth the seven bowls of the wrath of God." 2So the first angel went and poured his bowl on the earth, and foul and evil sores came upon the men who bore the mark of the beast and worshiped its image. These people persecute the elect. They are judged by that but it’s only a short-lived period as Christ will deal with this earthly system of idolatry. He will tear it down. It is not a question of simply punishing these people. It is a matter of bringing people to the point where God can alter their minds to go into the Millennium. Some people at this point in time cannot be dealt with in their present state. The example of the end days is shown in the story of Sodom and Gomorrah, where their mindset was such that God had to kill them. The destruction of Sodom was done by angels under instruction from Christ at the time, and Lot was taken out. The reason why Lot’s wife was turned into a pillar of salt was that she longed to be back into the system from which God brought her out. It was done as an example to us. Lot’s wife was destroyed so that we might understand that we cannot take anything from this system into the Millennium. The reason is that every sub-system and every part of the sub-systems of this system we are in now is inherently evil, in every aspect of it. That is why the new millennial system will be set up under the exact Law of Moses. The Law of Moses (i.e. God’s Law) was given to Moses and us together by Christ. We are going to make the system given to Moses work. The foul and evil sores are both a physical and spiritual concept. If we adopt ungodly systems, we adopt a series of problems. The physical aspect could be related to the reading of implant codes and the radiation problems associated with that fact. The implant codes are perhaps on the hands and the forehead for crowd control etc. The very fact of the existence of these earthly systems will cause these sores. These things are not God inflicting punishments on them, but are direct debilitating problems that arise from their actions. Everything we do has a consequence. In wartime the security requirements will be increased and hence also the problems like this. Every living thing dies. They were called to repentance under the Witnesses where a third die but in this case they destroy the seas – they destroy everything. 4The third angel poured his bowl into the rivers and the fountains of water, and they became blood. 5And I heard the angel of water say, "Just art thou in these thy judgments, thou who art and wast, O Holy One. 6For men have shed the blood of saints and prophets, and thou hast given them blood to drink. It is their due!" There will be no fresh water on the planet. Under the fourth seal a quarter die from famine and pestilence. Under the war of the sixth trumpet a third of the earth is killed. We are now down to the point where over half the planet is dead before we start this sequence. Two billion dead before we get into the wrath of God. We are looking at the destruction of the earth. 7And I heard the altar cry, "Yea, Lord God the Almighty, true and just are thy judgments!" 8The fourth angel poured his bowl on the sun, and it was allowed to scorch men with fire; 9men were scorched by the fierce heat, and they cursed the name of God who had power over these plagues, and they did not repent and give him glory. God has power over the plagues. He can stop it in a minute. Why have we let half the planet die? All we had to do is repent. Nobody says: “I got it wrong, Lord, please show me the way”. We did not need to see half the planet die before we repented. We can see the Lord dealing with us now. Why can’t they see it then? These people after all this still think they can dictate terms to God. We are in Jerusalem as spirit beings under the protection of Christ, dealing with this while it is happening. We are dealing with the planet hand in hand with Christ. The planet is breaking down. The Kings of the East are the Anotoli Heliou, or the Kings of the rising sun, who will come in over the Euphrates. Vast eastern armies will enter Israel towards Jerusalem. This sixth angel’s trumpet seems to indicate that the coming of the Messiah is related to the drying up of the Euphrates, and that the Messiah does not come until this time. It appears that the Messiah comes to Jerusalem and then deals with the planet. The general populace at this time is given greater revelation and understanding and is then dealt with during the time of the sixth angel. This earthquake is even greater than the earthquake of the heavenly signs in the sixth seal. The problem compounds as the seals develop. The sixth seal warned the earth of the Advent of Messiah and the wrath of God, yet they did not repent. This last action destroys the entire system of false religion and Satan’s activities on the planet. There is a recapitulation theory put forward by medieval Catholic monks (supposedly from Ticonius, an alleged Donatist, who influenced Augustine). The theory states that the trumpets and vials are restatements of a single position. It is highly unlikely, although there is some basis to the contention in that Christ states both at the sixth seal and the sixth trumpet: “Lo, I am coming”. It is put in brackets at the end of chapter 15. The concept is probably that these things are developed and set up on a continuing basis so that the rivers turn to blood, and then simply get worse as it proceeds, until finally Christ is dealing with the whole planet. This is complex and will not be addressed fully in this paper. There are objections to it. What is probable is that there is an advent and then the people are brought down to fight against him at Jerusalem, thus increasing the effects. The sequences of the trumpets and seals in terms of turning the rivers to blood are already set in motion. The red tides etc. are already in the seas – they are already starting. They have not killed a third of the rivers and a third of the fish life but they have started. The point the Bible is making is that the process is ongoing and that each trumpet is a result of the previous activity. The culmination is that Christ deals with everybody. After Christ has taken the planet through the trumpets and vials he is then ready for the great battle of God Almighty. This is the war of Ezekiel in the sixth seal. We will not deal with Ezekiel’s prophecy here. Revelation 16:12-16 deals with the battle of Armageddon or the war of Ezekiel. There is also a cross-reference to Luke 19:27. This is not an off-hand remark. This one line is the entire battle of Armageddon. The nations are brought down and slain before Christ at this battle. The religious structure of the world is then destroyed; the mainstream Christian Churches are destroyed by the Beast. That is what chapters 17 and 18 are talking about. This is complex and will be explained at a later date. We should all remember the sequence of the kingdoms in Daniel Chapter 2 from Nebuchadnezzar dating from the Battle of Carchemish in 605 BCE down to the last days and the coming of the Messiah when he smashes these kingdoms to pieces, which ends with the kingdom of the ten toes. Daniel 2: 1In the second year of the reign of Nebuchadnez'zar, Nebuchadnez'zar had dreams; and his spirit was troubled, and his sleep left him. 2Then the king commanded that the magicians, the enchanters, the sorcerers, and the Chalde'ans be summoned, to tell the king his dreams. So they came in and stood before the king. 3And the king said to them, "I had a dream, and my spirit is troubled to know the dream." 4Then the Chalde'ans said to the king, "O king, live for ever! Tell your servants the dream, and we will show the interpretation." 5The king answered the Chalde'ans, "The word from me is sure: if you do not make known to me the dream and its interpretation, you shall be torn limb from limb, and your houses shall be laid in ruins. 6But if you show the dream and its interpretation, you shall receive from me gifts and rewards and great honor. Therefore show me the dream and its interpretation." 7They answered a second time, "Let the king tell his servants the dream, and we will show its interpretation." 8The king answered, "I know with certainty that you are trying to gain time, because you see that the word from me is sure 9that if you do not make the dream known to me, there is but one sentence for you. You have agreed to speak lying and corrupt words before me till the times change. Therefore tell me the dream, and I shall know that you can show me its interpretation." 10The Chalde'ans answered the king, "There is not a man on earth who can meet the king's demand; for no great and powerful king has asked such a thing of any magician or enchanter or Chalde'an. 11The thing that the king asks is difficult, and none can show it to the king except the gods, whose dwelling is not with flesh." 12 Because of this the king was angry and very furious, and commanded that all the wise men of Babylon be destroyed. The meaning of the prophecies of the Last Days and the Empires of the earth is given by God to His prophets and they are given to reveal it to the people of the earth. 22 he reveals deep and mysterious things; he knows what is in the darkness, and the light dwells with him. 23 To thee, O God of my fathers, I give thanks and praise, for thou hast given me wisdom and strength, and hast now made known to me what we asked of thee, for thou hast made known to us the king's matter." It is God that sets up visions and dreams and reveals to men His wishes through His prophets so that they may know that it is He that is God. Once given the understanding Daniel knew what it was in the vision and what he had to do to prove that he was a prophet of God. This vision was to cover all time from the Battle of Carchemish in 605 BCE to the return of the Messiah at the end of the 120th jubilee before the end of the last Sabbath cycle and the Jubilee in 2027 CE at the end of Satan’s reign. 24Therefore Daniel went in to Ar'i-och, whom the king had appointed to destroy the wise men of Babylon; he went and said thus to him, "Do not destroy the wise men of Babylon; bring me in before the king, and I will show the king the interpretation." 25Then Ar'i-och brought in Daniel before the king in haste, and said thus to him: "I have found among the exiles from Judah a man who can make known to the king the interpretation." 26The king said to Daniel, whose name was Belteshaz'zar, "Are you able to make known to me the dream that I have seen and its interpretation?" 27Daniel answered the king, "No wise men, enchanters, magicians, or astrologers can show to the king the mystery which the king has asked, 28but there is a God in heaven who reveals mysteries, and he has made known to King Nebuchadnez'zar what will be in the latter days. Your dream and the visions of your head as you lay in bed are these: 29To you, O king, as you lay in bed came thoughts of what would be hereafter, and he who reveals mysteries made known to you what is to be. 30But as for me, not because of any wisdom that I have more than all the living has this mystery been revealed to me, but in order that the interpretation may be made known to the king, and that you may know the thoughts of your mind. Then Daniel explained to the king what it was that he saw and what it meant. Then the king understood that it was God in heaven that had revealed the vision to Daniel. 31"You saw, O king, and behold, a great image. This image, mighty and of exceeding brightness, stood before you, and its appearance was frightening. 32The head of this image was of fine gold, its breast and arms of silver, its belly and thighs of bronze, 33 its legs of iron, its feet partly of iron and partly of clay. 34As you looked, a stone was cut out by no human hand, and it smote the image on its feet of iron and clay, and broke them in pieces; 35then the iron, the clay, the bronze, the silver, and the gold, all together were broken in pieces, and became like the chaff of the summer threshing floors; and the wind carried them away, so that not a trace of them could be found. But the stone that struck the image became a great mountain and filled the whole earth. 36"This was the dream; now we will tell the king its interpretation. 37You, O king, the king of kings, to whom the God of heaven has given the kingdom, the power, and the might, and the glory, 38and into whose hand he has given, wherever they dwell, the sons of men, the beasts of the field, and the birds of the air, making you rule over them all--you are the head of gold. 39After you shall arise another kingdom inferior to you, and yet a third kingdom of bronze, which shall rule over all the earth. 40And there shall be a fourth kingdom, strong as iron, because iron breaks to pieces and shatters all things; and like iron which crushes, it shall break and crush all these. 41And as you saw the feet and toes partly of potter's clay and partly of iron, it shall be a divided kingdom; but some of the firmness of iron shall be in it, just as you saw iron mixed with the miry clay. 42And as the toes of the feet were partly iron and partly clay, so the kingdom shall be partly strong and partly brittle. 43As you saw the iron mixed with miry clay, so they will mix with one another in marriage, but they will not hold together, just as iron does not mix with clay. Their final empire shall be a union of ten groups intermingled and as a marriage set together but they will be unable to stand, and the final union will be unable to remain and God shall send to judge them His final prophets of Jeremiah 4:15-16 (see the Warning of the Last Days (No. 044)). Then that system will be replaced by the Two Witnesses that will stand for 1260 days clothed in sack cloth in Jerusalem (see the paper The Witnesses (including the Two Witnesses) (No. 135)). They will be killed and lie in the streets for 3.5 days and on the morning of the Fourth Day the Messiah will descend and they and the elect will be resurrected and the Nations will be subjected and brought into captivity to Messiah and the elect (see the paper Heaven, Hell, or the First Resurrection of the Dead (No. 143A)). This process will be carried out in the Wars of the Last days and the Vials of the Wrath of God (No.141B). 44And in the days of those kings the God of heaven will set up a kingdom which shall never be destroyed, nor shall its sovereignty be left to another people. It shall break in pieces all these kingdoms and bring them to an end, and it shall stand for ever; 45just as you saw that a stone was cut from a mountain by no human hand, and that it broke in pieces the iron, the bronze, the clay, the silver, and the gold. A great God has made known to the king what shall be hereafter. The dream is certain, and its interpretation sure." 46Then King Nebuchadnez'zar fell upon his face, and did homage to Daniel, and commanded that an offering and incense be offered up to him. 47The king said to Daniel, "Truly, your God is God of gods and Lord of kings, and a revealer of mysteries, for you have been able to reveal this mystery." 48Then the king gave Daniel high honors and many great gifts, and made him ruler over the whole province of Babylon, and chief prefect over all the wise men of Babylon. 49Daniel made request of the king, and he appointed Shadrach, Meshach, and Abed'nego over the affairs of the province of Babylon; but Daniel remained at the king's court. Then the sequence of the entire world, from the rule of Nebuchadnezzar at 605 BCE over the period Seven times to 1916, and then over the period of the Fall of Egypt as revealed by God to Ezekiel regarding the Fall of Egypt in the prophecy of Pharaoh’s Broken Arms (No. 036) and the Fall of Egypt the Wars of the Last Days (No. 036_2) which ended in the end of the Time of the Gentiles in 1996, was revealed to the prophets. The Book of Daniel was to detail the time sequence to the end and the coming of the Messiah. We are in the last days now and the Banking crisis we are about to endure is not to destroy this Empire of the Beast but rather to establish it, so that the world can be established as this union of ten toes under the Ten Kings of the Last Days. These are financial groups that cover the world and the whole world gives its power to the Beast under these ten kings which are in fact financial groupings. Greece and the EU is but part of this system that will seek to combine the Empire of the Beast as we explained in the paper WWIII Part 1: The Empire of the Beast (No. 299A). The Religious system of the Sunday Worshipping Trinitarians seeks to control this system but it will not do so and will be destroyed but that will not be for a few years yet (see the paper WWIII Part II: The Whore and the Beast (No. 299B)). The book of Daniel is set out to deal with the kingdoms from Babylon through the Medes and Persians and then the Greeks, the Romans and the Holy Roman Empire and the Wars of the Last Days from the political movements from 1912-1916 and the Holocaust of WWII and then the Wars of the End to the period of WWIII and the Vials of the Wrath of God from 2001-2024. We will now explain the Book of Daniel and then the financial collapse and control of the world about to be unleashed on us. Greece is but the start of the establishment of the final financial empire of the Ten Toes in which the nations will hand power to the beast.